This was my thought when I woke up in a room I was renting for a month this summer in Washington, D.C. It was a shabby brick brownstone between U Street and Dupont. I was there for a few weeks after getting back from studying abroad in England, working at an end-of-summer internship before returning for my senior year in Chapel Hill. All signs pointed to a geographical identity crisis. When I had ordered a new credit card after an Oxford ATM ate my old one, I had no permanent address to give to the bank and I couldn’t remember my temporary one. I was doing my best to make a mishmash of winter clothes and summer clothes, still wrinkly and smelling like my hiking pack, function as an acceptable office wardrobe. There were three types of currency jostling each other in my pocketbook, eliciting strange looks at the CVS when I tried to pay for my peanut M&Ms in euros. A sail-less ship? A rootless tree? I tried to console myself with metaphors as I stared at my suitcase and wondered why I had unpacked in the first place. I grew up in Cedar Rapids, Iowa. My first big move was coming to North Carolina for my first year at UNC. I’d never been out of the country before and it was only my second time east of the Appalachians. When people started talking about studying abroad, I thought they were crazy. I had only just gotten used to hearing “y’all” on a daily basis, to grits in the cafeteria. I was starting to be less terrified of getting on a bus. Now I was supposed to leave? Others seemed enthralled by the idea of rural villages in Asia and mountaintops in South America. I was just scared. Three and a half years later, I can safely say my time at UNC has, paradoxically and wonderfully, been defined in large part by my time not at UNC. I love it here. But Chapel Hill has stubbornly resisted becoming “home,” transforming instead into a spiritual base camp for my journeys elsewhere. I’m starting to think, however, that UNC wanted it this way. Because they’re really not joking around when they say they want to help students develop a global perspective. Even those who, because of academic or financial limitations, don’t leave North Carolina during their four years here, find their professors and extracurriculars consistently calling them to acknowledge the world outside the contiguous 48. As I navigated through four years as a UNC student, due to both academic work and actual travel, other countries rose from the colored world map in my atlas to three-dimensional, flawed, beautiful and vibrant places. I was terrified to come to school here and then terrified every time I left here. But the world became more real with each departure. I could tell I was growing; we were all growing. Still, it was hard not having a home. In my rented room in D.C., still resisting the beeping of my alarm, I pondered the concept. I knew I couldn’t call Chapel Hill home. I hadn’t been there in nine months, and it was always clear to me I couldn’t be a true capital-S Southerner (despite my newfound love of a certain second-person-plural.) I also couldn’t call Iowa home. I hadn’t spent more than four consecutive weeks there since high school and was identifying with it less and less as time passed. I’d been in England six months, Spain one, D.C. a few weeks. I loved all three but could claim none. I searched for old adages: home sweet home? I’ll be home for Christmas? Home is where the heart is? That last one sounded promising. Where is my heart? I wondered. OK, a little piece of it will forever be with Tyler Hansbrough. A little piece was in my favorite Davis study carrel with the best graffiti, seventh floor, to the left. Of course, my family was still in Iowa, and they had a big hunk of it and always will. The friend had a point. But there’s a caveat. It took me a while to realize this — four years, to be exact — but loving where you are, and loving the people you’re with, doesn’t have to be at the expense of loving other people, other places. You can love the ones you’re with and love the ones you’re not with. I may only see my family on major holidays, but it doesn’t mean I love them any less than the friends I see every day in the Pit. I may never live in England again, or Chapel Hill, for that matter, but that doesn’t mean I don’t treasure my memories from either place. In fact, perhaps I treasure them more. There isn’t a finite amount of love to go around. It’s hard, at times, to have your heart, and thus your home, in so many different places. When the time comes, someday, I’m sure I’ll enjoy a non-nomadic year. But as I opened my eyes in my (temporary) D.C. home, I realized the sadness I felt was actually happiness, at its core. The more people and places you miss, the more people and places you love. And this is the greatest mandate my UNC education has given me: to love the world — and to give to it — as much as you possibly can. 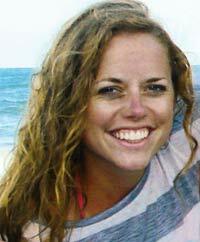 Erin Becker ’11, of Cedar Rapids, Iowa, majored in English with a minor in creative writing. She is moving to Santiago, Chile, to satisfy more wanderlust before returning to get a doctorate in English.